Hamilton DNF and Seb win, yes, nice Sunday. If only........not that it would matter in the end, sadly. WDC is pretty much done and dusted but WCC is still possible. Merc's tire strat looks concerning. They could be in a dilemma during the race IF a 2 stopper. Everyone else looks good from a 2 stop perspective. With such a huge difference between Ferrari, Merc and RBR and where every car is strong on the lap it's really going to be interesting. Personally I can't see how RBR will be able to keep both Ferrari and Merc behind them as they are more than 10 km/h slower on the straight for 71 laps. Even if they are quicker through S2 and S3 that speed can basicly only be used in clean air as you can't utilize it too close to someone infront. And with DRS from lap 2 onwards it's going to be hard even if they somehow survive the start. 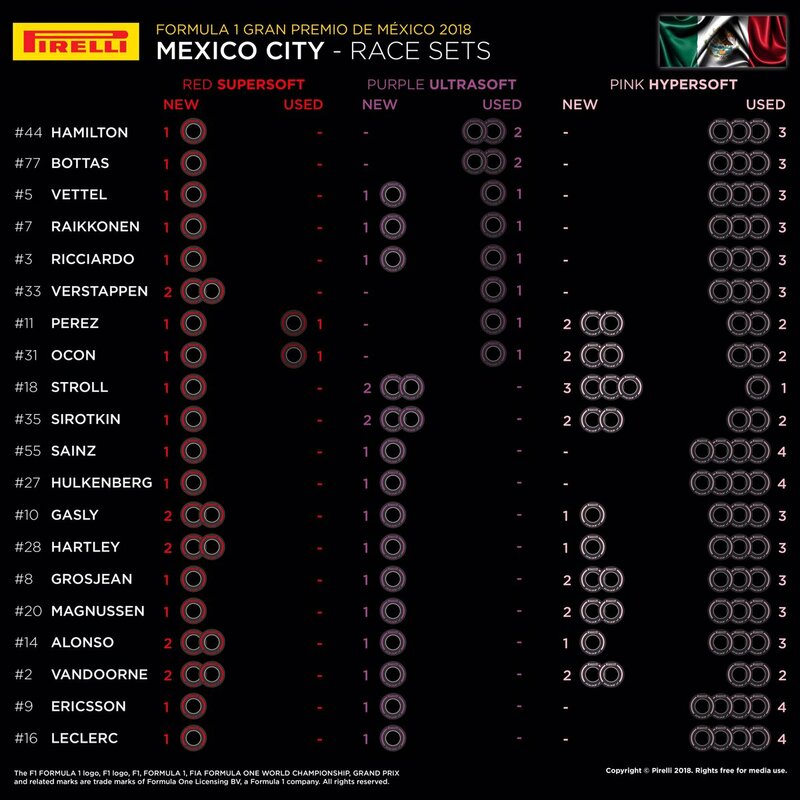 As for Ferrari vs Merc I guess tyre management will be the decisive factor. Merc will be more competitive compared to Austin as they now run the new rims again. Merc also don't have any new ultra softs left. So if everyone is forced on to two-stoppers they will be compromized. The start is going to be mayhem. 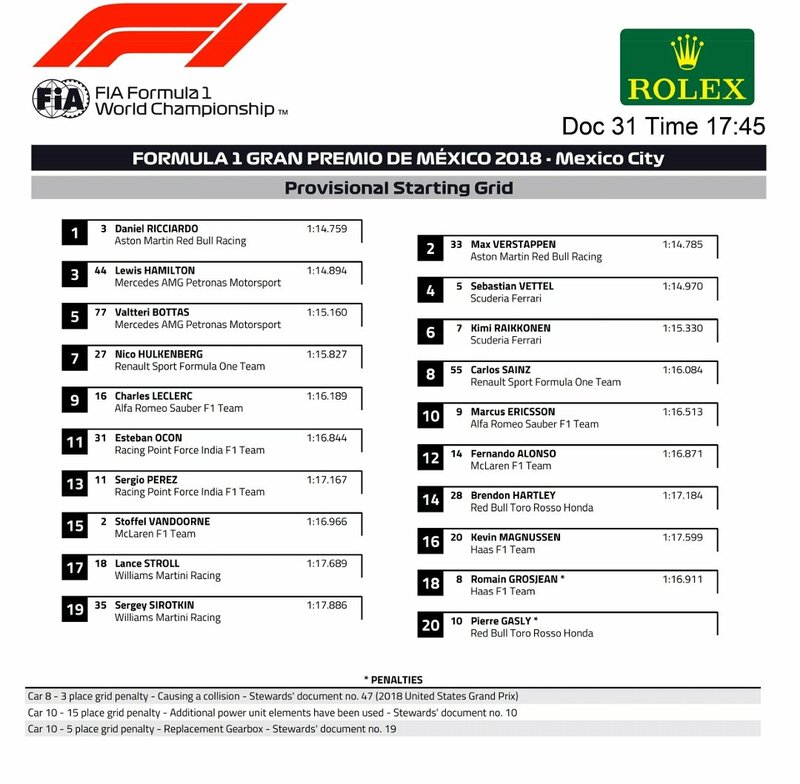 I wont be surprised at all if either Seb or Ham gets taken out in the first lap. Maybe both. Along with max of course. Its a complete lottery. Tyre stats looks interesting. Mercs in defensive, if it’s 2 stop Race. I’m expecting high temp, this opens up the race. Could someone post a link to a stream. PLEASE Seb.. no spin this time. Ughh.. I decide to watch this one and I can't find a single stream that does stop every 8-10 seconds. Turn one can be a hell of a pile up. Bottas or Kimi could very well be leading the race after turn one. The worst outcome would be everyone making it through turn one. Boooooooring. Mathematically it’s possible. Logically, it’s over. I will be very surprised of Max doesn't do something stupid to someone on the first and second row. Something is going to happen. My hope is that Max goes all in. Takes out Danny and collects Lewis. Seb cruises to victory with Kimi passing Mr Potato Head for anFerrari 1-2. That would be fun to watch. Hamilton will still win his 5th title in Brazil but at least this will make it interesting. I think Ricciardo will be defending his pole more aggressively. He's not gonna let Max overtake him at the start, this is personal. Let's hope Vettel will stay out of trouble at the start.